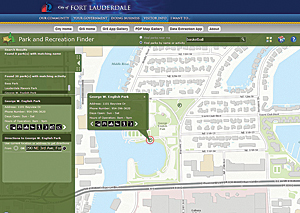 GIS manager Ian Wint discovered he could rapidly expand the City of Ft. Lauderdale's collection of mapping applications in a fraction of the time by configuring the templates from Esri like this Park Finder application. Not only has the demand for your skills remained strong in government, utilities, and natural resources organizations, but the commercial real estate, insurance, marketing, and logistics industries are discovering the value of GIS and are providing new opportunities for GIS professionals. As positive as this situation is, the future is even brighter. Because GIS is undergoing a profound transformation. It is becoming web GIS. It is a new pattern for delivering GIS capabilities that lets people everywhere access and use geographic information on desktops, the web, tablets, and smartphones. 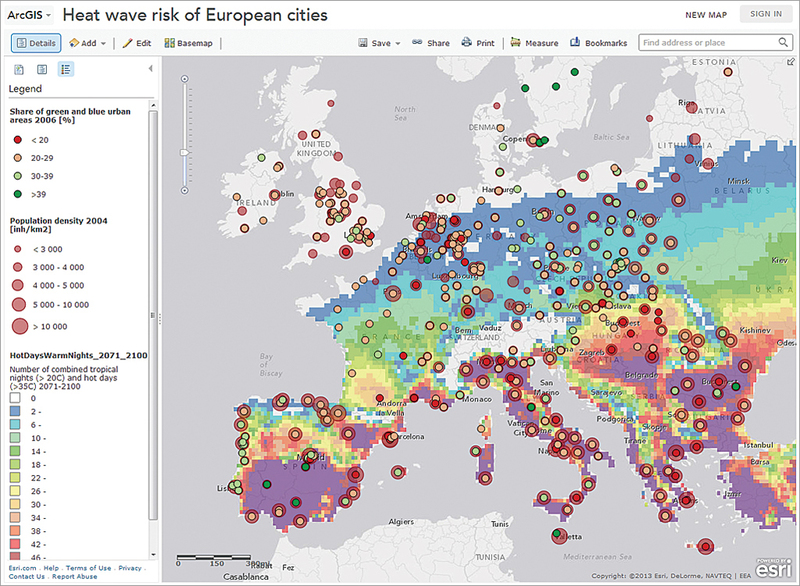 Web GIS is the centerpiece of Esri's strategy for implementing GIS as a platform. Conceptually, web GIS is agnostic with regard to how it gets implemented. It can run on a local network on-premises using ArcGIS for Server and Portal for ArcGIS or on ArcGIS Online in the cloud hosted by Esri or some combination of these strategies. Web GIS expands, rather than replaces, existing GIS in organizations. With web GIS, people can not only access maps and apps on consumer devices and the web but easily build maps that work everywhere. With the wide variety of ready-to-use applications and application templates, there is far less need for creating custom applications. 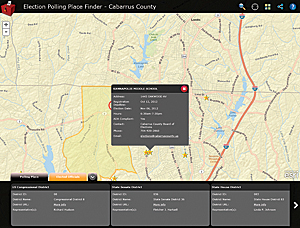 Cabarrus County, North Carolina, GIS administrator Zachary Woolard implemented Esri's Polling Place Locator template. "Within a week of discussing how we could improve our service, we were demonstrating the completed application to our Board of Elections," said Woolard. What Can You Do with Web GIS? The web GIS pattern also provides a new pattern for integration. Maps and apps can bring in all kinds of data from tables, enterprise systems, and spreadsheets and integrate it with social media and sensor networks. With ArcGIS GeoEvent Processor for Server, an extension to ArcGIS for Server, your organization can take advantage of the vast quantities of data being captured in this increasingly instrumented world by ingesting streams from social media, in-vehicle GPS devices, and many sensor sources in real time and performing continuous analysis and processing as the data is received. Through dynamic linking from distributed services using web services and web maps, almost any data source can be integrated. This sidesteps the process of carefully restructuring data using data models that was previously required. Integrating GIS with other business systems, previously a formidable task, is now much simpler. Because web GIS is based on simple protocols like REST and other web standards, it can effectively embed GIS into existing enterprise systems like IBM Cognos, MicroStrategy, and SAP. Easy map creation and integration with business systems build cross-organizational collaboration, enhancing communication, and optimizing access to information. Web GIS makes it possible to tap into information from outside the organization by using the vast collections of ready-to-use maps and GIS services, including geocoding, routing, and geoenrichment accessed through ArcGIS Online. Whether web GIS is implemented through ArcGIS Online or Portal for ArcGIS, sharing maps and other resources is secure so web GIS can be used as a mapcentric content management system. Because GIS is transforming, so is your job. GIS professionals will be essential to this transformation. Instead of taking a month to fullfill each request for a hard-copy map, the Regional Transportation Authority (RTA) directs internal and external customers to an online map where they can interactively select a dataset, transit service, or jurisdiction and view it and run analyses on it in a matter of minutes. In the last few years, GIS departments have dealt with less of some things (fewer staff members, less time, and smaller budgets) and a lot more of other things (end users to support, technologies and platforms to implement and maintain, and new data types). It's now time to let go of a few things. Let go of the search for that monolithic killer that will meet all your organization's needs. Let go of making endless one-off paper maps. Let go of PDFs on your website that are nearly obsolete as soon as they are created. These things should not be your focus. The world moves too fast, and your time is too valuable to be spent on lower-level tasks. 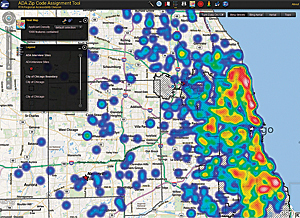 Embrace web GIS and the multiplier effect it can have on your impact on the organization. As a GIS professional, web GIS is the best way to increase the value of your work by sharing it with non-GIS staff. People in your organization who are eager to use maps can now do that on their own consumer devices. ArcGIS for Desktop remains the primary tool for creating authoritative data and high-quality maps. A library of useful maps and resources built using desktop GIS is the foundation of web GIS. In recent years, map publishing workflows have been reengineered to make it simpler to move work from the desktop to the web. Desktop users can contribute maps and make them available to as many people as desired almost instantaneously from literally any device or client. Beginning with ArcGIS 10.2, more GIS services will be available from ArcGIS Online, including analytical services such as routing with live traffic data, terrain analysis, and enhanced worldwide geocoding. ArcGIS 10.2 also introduces a new ArcGIS for Server extension called Portal for ArcGIS that delivers mapcentric content management and web maps tools like ArcGIS Online but is designed for users who host ArcGIS completely within their own infrastructure. 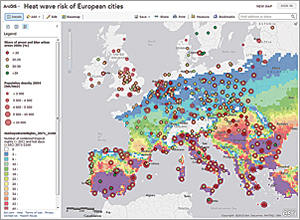 With Web GIS, you and your users can incorporate information from outside the organization by using the vast collections of ready-to-use maps and other resources shared on ArcGIS Online such as this map created by the European Environmental Agency showing the heat wave in Europe during the summer months of 2013. ArcGIS Online and Portal for ArcGIS multiply the value of ArcGIS for Server investments by transforming ArcGIS for Server services into information products that are easily available to anyone in the organization, solving the challenge of providing information quickly in a usable format. 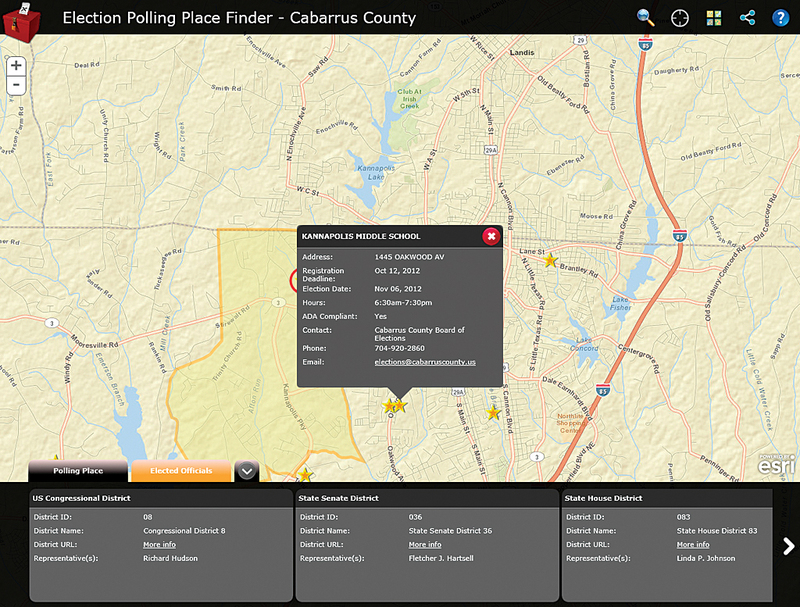 Organizational users can use maps and layers as is, add local data, or include data and services from ArcGIS Online to answer their own questions and create new information that can be shared back. With ArcGIS for Server and ArcGIS for Desktop, both servers and desktops can be connected with ArcGIS Online to create a fully integrated web GIS. Many GIS departments are using web GIS to carry out their traditional activities more effectively by enabling users to benefit from the powerful visualization and analytic tools available from ArcGIS Online. Other GIS departments are expanding the vision and role of mapping and GIS by involving all parts of their organizations. In either case, web GIS is being implemented as single-topic self-service maps and apps that don't require training or tutorials. Want to know where parks are in your city? 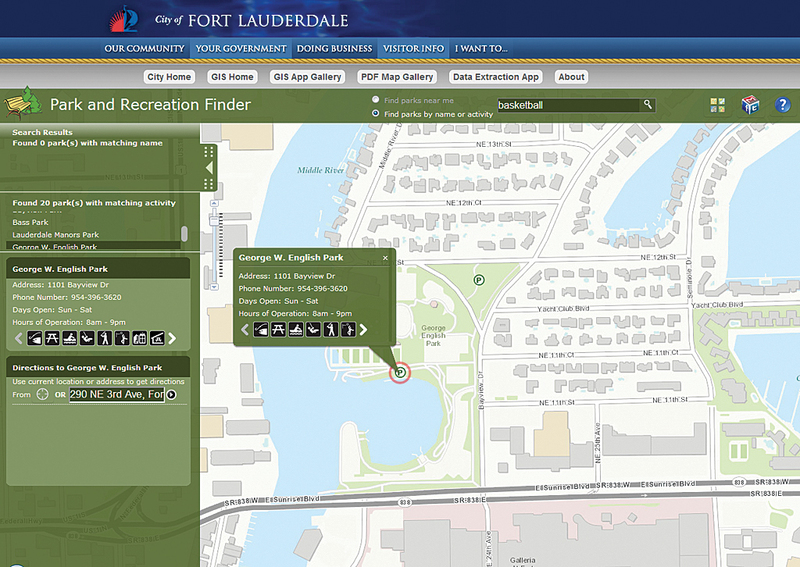 Web GIS has an app for that—specifically, the Park and Recreation Finder app available from the AcGIS for Local Government Resource page. 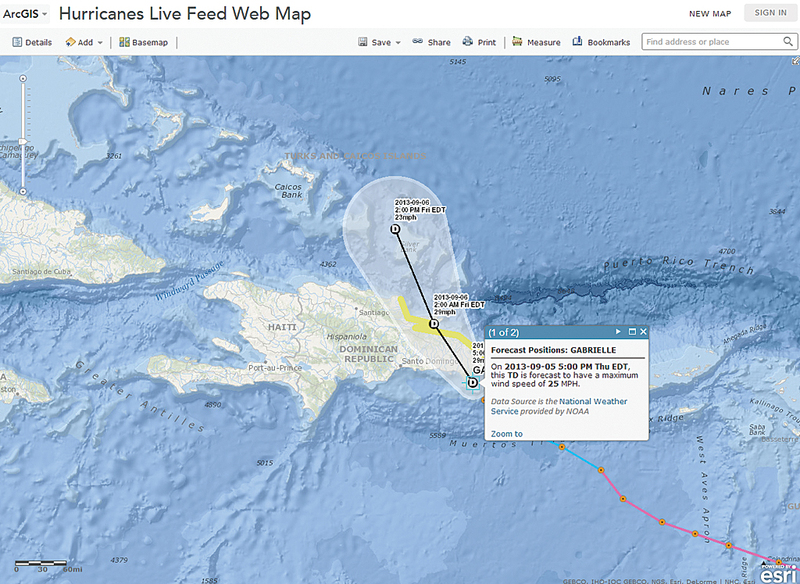 These and the many other map apps and templates are constantly developed and released by Esri. These apps let users help themselves to answers using your organization's most current data. They solve common problems and require only configuration to get them up and running, eliminating the long (and expensive) development cycles associated with traditional monolithic, "do it all" applications. Using this approach lets GIS departments get a greater return on existing investments in GIS. Because web GIS is based on simple protocols like REST, it can integrate data from many sources such as the live data feeds of current and recent tropical storm locations obtained from the National Hurricane Center and the Joint Typhoon Warning Center. However, to be successful in this new environment will require more than just a diverse skill set. It will require GIS professionals who have a strategic mindset and use a business-oriented approach to implementing GIS. They will succeed by seizing opportunities for combining existing data in new ways with data and services available from ArcGIS Online and always favoring configuration over customization when choosing solutions. When possible, they will speed implementation and limit cost by using cloud-based solutions like Esri Community Analyst and Esri Business Analyst Online that require no infrastructure. GIS professionals also need to see users as customers. They need to be GIS evangelists and sell GIS by exceeding user expectations. GIS professionals with a strategic mindset speed implementation and limit cost by using cloud-based solutions like Esri Business Analyst Online that require no infrastructure. Self-serve apps don't replace GIS professionals. Freed from rote tasks by self-serve web apps, GIS professionals can concentrate on high-value activities like the creation of authoritative datasets and spatial analyses that yield actionable information for the organization. By embracing the new capabilities of web GIS, the benefits of GIS can be spread across organizations. By any measure, this is an exciting time for GIS professionals. Web GIS is opening the world's eyes to the power of spatial visualization of information, and this change in perception is transforming how people understand the world. Nevertheless, the fundamental mission of the GIS professional—helping streamline processes, inform decision making, and improve communication by incorporating a geographic perspective—remains the same.